Foraging for food is by far one of life’s greatest and underrated pleasures. It’s not only a great excuse to get outside, connect with your environment, and get to know your local flora, but whatever you find is organically grown and free! Could it get any more gratifying than that? I doubt it. The edges of the bike path below my apartment here in Copenhagen, are lined with hundreds upon hundreds of wild blackberry bushes. Be still my heart! I have been dreaming about the day when the juicy little jewels turn from a deep pink to almost black, their juicy weight bending the thorny branches of their tangled mess of a home. “Isn’t it a little early for blackberries?” a man asked me as I was poking around in the brambles this morning. Au contraire, my Danish friend. An avid forager will know exactly the right time to strike, especially if she wants to get to the goods before everyone else does. 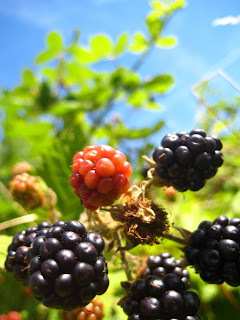 There were certainly enough ripe berries to pick; I just left the pink ones to sunbathe a little longer. By now the strawberries have come and gone, raspberries have seen better days, but blackberries are making their way into the spotlight. Choosing the ripe berries is relatively easy: they should be very dark purple (almost black, imagine that), firm, and bulging with juice. In fact, picking them should involve little more than a slight brush of your hand – if they require tugging of any sort, they are not ready to come home with you. Unripe berries will not ripen once picked, so leave those ones for a few more days and they will taste far sweeter. When I got home with a full basket and a full tummy, I had the overwhelming urge to bake something sweet and decadent. I am, after all, having a Canadian friend come visit me, and baking is the best way I know to make guests feel welcome. I came up with this simple, whole-foods recipe from several unhealthy ones I found online, and the results are insanely delicious. Please make this, I beg you. 1. Peel apples, chop and stir in lemon juice. 2. Submerge blackberries into a large bowl of water and gently turn to remove any dirt, leaves etc. Drain and combine with apples. 3. Sprinkle sugar, flour and 2 tsp. cinnamon over top of the fruit and mix. 4. In a separate bowl, combine rolled oats, maple syrup, walnuts and remaining cinnamon. Cut in cold butter until crumbly. Spread over fruit. Add a sprinkling of raw sugar on top, if desired. 5. Bake at 350 degrees F for 25 minutes. You could serve this with ice cream (made from goat’s milk, obviously) – but alas, I could not find any here in Copenhagen. Blackberries abound in antioxidants, such as anthocyanin pigments, responsible for the purplish-black colour of blackberries and may impart health benefits because of their antioxidant properties. Additional antioxidants in blackberries are vitamins C and E, and ellagic acid; all may provide protection against cancer and chronic disease. Cooking does not seem to destroy ellagic acid, so even blackberry jams and desserts retain ellagic acid health benefits. Crumble anyone? PS. Thanks for sharing all these wonderful recipes with us. also provided a layered PSD (Photoshop) file of the design mockup. E-commerce solutions even enable completely secure online ordering and payments. Hello! I just would like to give you a huge thumbs up for your great info you’ve got right here on this post. I will be returning to your website for more soon. I got what you mean, thanks for putting up. Woh I am gladsome to see this website finished google. Thanks For Share Penyebab Bunyi Berdecit Pada Tali Kipas Mobil | Trisangga Raya Rent Car. I truly enjoy reading through on this web site, it has got fantastic content. “Don’t put too fine a point to your wit for fear it should get blunted.” by Miguel de Cervantes. Just wanted you to know I have added this blog to my bookmarks.I’ve seen your other blog topics too and I can tell you’ve got excellent content. Good Job! Thanks a bunch for sharing this with all of us you really recognise what you’re talking approximately! Bookmarked. Please additionally visit my site =). We will have a link trade agreement among us! I agree aided by the era, but, I believe that, that this is a Diplomat not a LeBaron. just made a strawberry rhubarb version. the sweetness was perfect! i tried using agave nectar & arrowroot hoping the arrowroot would thicken the “sauce” up a bit..didn’t work as well as i hoped 😛 the agave made the sauce a little looser than sugar would, but nothing catastrophic. i’ll try brown rice syrup & flax next time! So i did up the gluten-free version of this with flax meal like you suggested and it was fabulous! Thanks for the tip! So glad you like the crumble. I still make it all the time! my husband and i made this and it was just delish! i’m hoping to make it this weekend for easter, but my mom is celiac. is there a gluten-free flour that would substitute in well in this recipe? What a fun site! Great to hear about foraging expeditions around the world. I just love hunting blackberries as well. 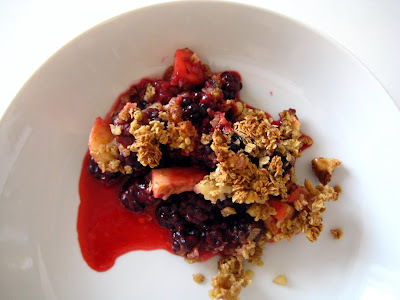 This crumble sounds fantastic! I made this for a dinner party and people went berserk. I will be making it for my parents (and myself) again soon. huzzah! oops – I used gala apples because they are crispy and sweet to offset the tartness and softness of the berries. Love your blog! Thanks for sharing all these jewels. Question about the crumble recipe. Can agave nectar be substituted for the sugar? Also, any particular kind of apples? Thanks much!